This is the second part of working with ggplot. We will combine the packages dplyr and ggplot to improve our workflow. When you make a visualisation you often experiment with different versions of your plot. Our workflow will be dynamic, in stead of saving every version of the plot you created, we will recreate the plot untill it looks the way you want it. In the previous lesson we worked with some build in datasets. But there is often more fun in public real world datasets. We will work with the Dutch government data about higher education more info at . To help you along I have already transformed the data into a more tidy format 1. The data can be found at my github repository at this link: https://github.com/RMHogervorst/cleancodeexamples/blob/master/files. UPDATE 2017-08-23, SPSS FORMAT HAS CHANGED IN HAVEN, SO NEW DATA (2016) WITH FILES BOTH IN SPSS AND CSV FORMAT. the packages: dplyr, ggplot2, readr. Start a new project in Rstudio or open a project you created in a previous session 2. Copy the steps in your script or the console or follow the script. 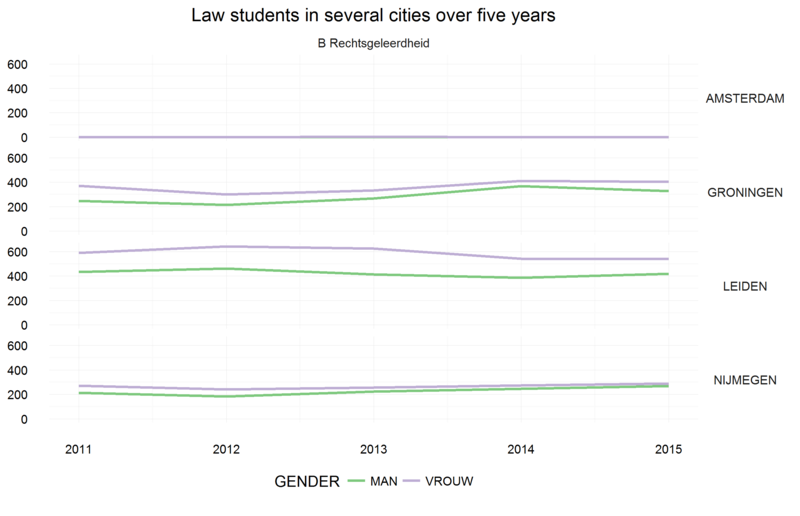 The file contains the number of students per year per gender per program in Dutch Universities between 2011 and 2015. Look around the dataset and get a sense of what it contains. Unfortunately for non-Dutch speakers, the set is entirely in Dutch… But I will explain the variables for you so far as I know. Now that we know the structure of the dataset we can look at parts of it. In SPSS if you want to look at a subset of your data you would either create a selection group or save some results to a different file. While we can do that in R, it’s better to create a pipeline of data and change some of the steps. IT saves memory (mostly not important) but even better it keeps your dataset intact and prevents a filelist of over 200 files with uninspiring and meaningless names such as: dataset1, dataset2AFTERSAVING, dataset456 etc. This will keep your work, your workspace and your code clean3. We will first look at some details in the dataset. Follow along if you like but even better would be if you try to vary some steps. Instead of YEAR ==2016 take 2011 or only take master students. Learn by making mistakes and by following up on interesting side stories. # First filter on 2015, full time and bachelor. This will display a subsample of your data. But for every unique program there are two rows. One for males (MAN) and one for females (VROUW). You might not care for the seperate groups and want to combine them. This might seem like a lot of typing, but you can just modify the last part of the commands by adding the group_by and summarize commands. An other thing you might have noticed, is that the previous data frame result is now gone and replaced by this result. That is fine, it was temporary anyways. An other question could be if the numbers per program changed over time? However there is just to much information to compare. Let’s see if we can visualize these numbers. Now this might look a bit odd because we will combine a chain of commands with the pipe (%>%) operator and then we add layers of the plot with the plus sign (+)4. Think back to part 2 of this course about chaining and dplyr We started with the same chain that created a the summarized data frame. That data frame can be imported by ggplot. Remember that the pipe operator puts the end result as first argument in the command after it. 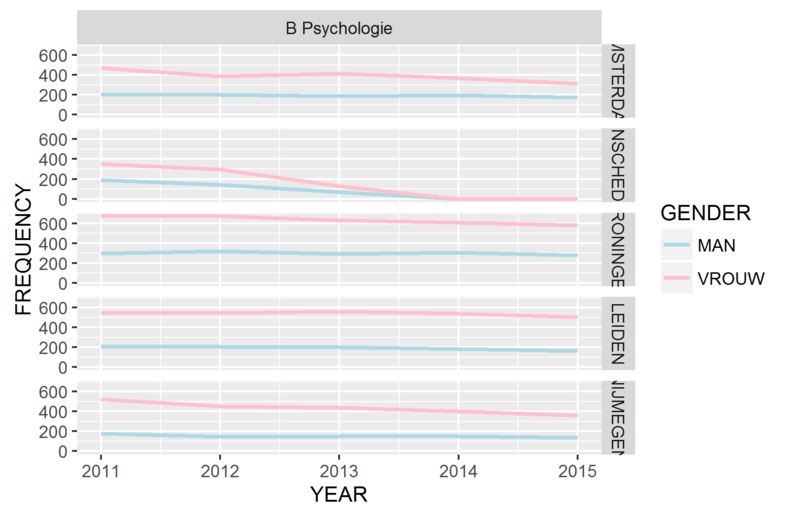 dplyr = layered grammar of data manipulation and ggplot2 = layered grammar of graphics . So we have two sets of grammar here. # do you still see where the arguments of every command are? As you can see it’s hard to read what happened, or when things break, what arguments belong to which function. further more for every plot call you need to create a temporary dataset. One you will probably forget to remove afterwards. The pipe operator works with every command that starts with a data argument and there are ways to make it work with other commands. It really makes your life easier. End of excursion, why don’t we make some useful plots. There is a lot of information in this dataset. We will need to be more specific in our questions. How many programs are there actually? There are 666 unique program names. Since every bachelor and masters program has a unique name and since bachelors generally give access to multiple masters, there are many many program names. But how many programs are there in the bachelor propedeuse phase? The end result is a data frame with 141 cases/ rows. Look at the data frame. * The setting up part ggplot() doesn’t draw anything yet. This is just a first plot, it’s far from pretty. 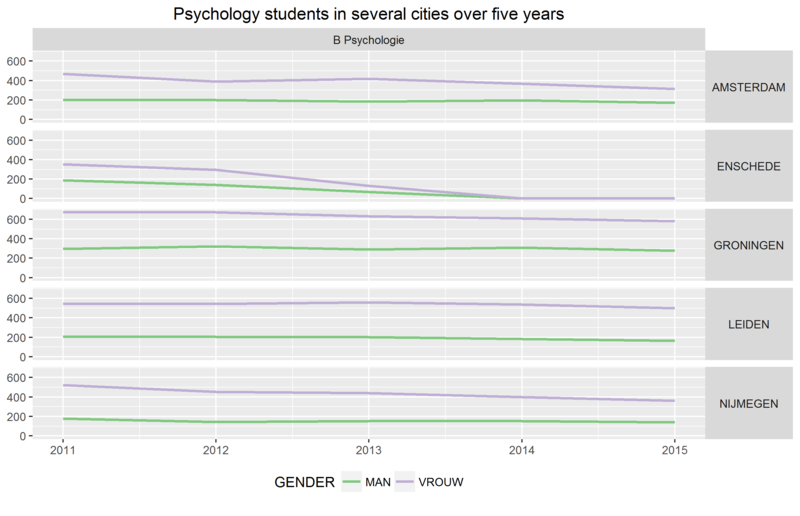 It has no title, the years at the borders of psychology and law overlap, the name of the municipal/ city is not readable, and the colors of the gender are counter intuitive. If I had used these colors, blue for males and red for females would be more in line with western culture8. 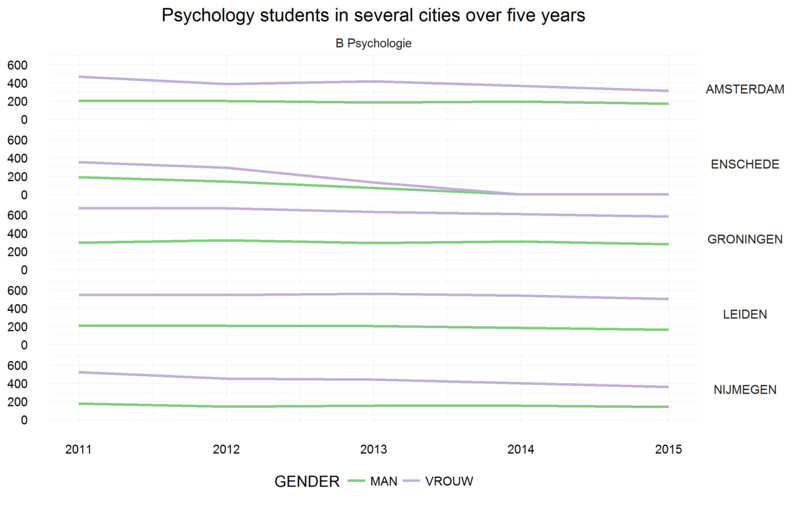 Another problem is that the Amsterdam numbers for Law are much lower then for Psychology, they don’t display so well on this scale. A separate plot for Psychology and Law would be better. Let’s address both color (going stereotype blue and pink) and program. After my first plot, I found the lines a bit thin, so I set the size. I also used a manual color scale. One of the odd things about rstudio is that if you click on the zoom button the plot looks good, but if you use ggsave it takes the uglier version in the side viewer. I guess I could change the settings in the ggsave command9. The colors in the plot are not so bright. Which is actually a good thing for printing. But in this plot it can make it hard to read. So let’s use some other custom colors. The colors are a number, how does that work? Colors in R, or in all sorts of programs really, can be specified with their name: “red, magenta”, “cyan”, “black” etc. Or with their html code “#000fff” pick it with this site. Take for instance the very ugly color “Aqua”, it has the name aqua, the html code #00ffff, rgb(0,255,255) and hsl(180,100%, 50%). Using a site such as the one above can help you in picking colours. to use in your plots. Try to plot the plot above with aqua or #00ffff as one of the values. An other way to change the colors is by using a color package. One great package is the color brewer package. Install the package and try RColorBrewer::display.brewer.all(n=8, exact.n=FALSE) to see the different colors. In the previous lesson we used different themes to customize the plots. We can change features of the plot like the title, axis labels, axis details and many more aspects. To add a title to a plot use the ggtitle command. So this works, but with the title the axis labels for years and frequency are redundant. To remove parts of a plot we need to modify the theme settings. A theme is used for all aspects of the plot. where the axis are, what the labels are and so forth. To modify these parts of the plot you need the theme() command. Inside the theme command you give the arguments axis.title.x= element_blank() to remove the x axis or legend.position= "bottom" to put the legend at the bottom of the plot. You don’t need to remember them all. Use the cookbook for r or search for what you want to change online. The first part is identical as before, but I’m a big fan of the minimal theme. It removes all sorts of chart junk. However, you don’t like the way the cities are placed. You want it horizontal. And you don’t like the labels on the axes. This is nice, but you want to recreate the same style for many programs and like any person you hate to copy paste everything. It is time for your own theme. A ggtheme has every option that you could set defined. So it is possible to create that from scratch, I do not recommend it. The best option is to use a predefined theme and overlay your changes, like you already did above, you first called the theme_minimal() layer and than changed some theme elements. And now with the Law program. In the previous lessons you learned how to make basic plots, how to select, filter and combine the dplyr verbs. This lesson you combined these skills. Furthermore you can now customize your plots, create a style/theme and apply that theme to your plots. Making it very consistent. This was the final introduction to R from SPSS. From now on, you are a R user. You know the basic commands, you can find what you are looking for online or in the help function, and you are able to generate advanced plots. Or at least in the Netherlands babyblue is a common color for males. Red not so much specific for females, but pink would be.